What is a Mug Rug? Where did the name come from? How big should it be? Is it a coaster? These are all question that were asked at the last meeting. 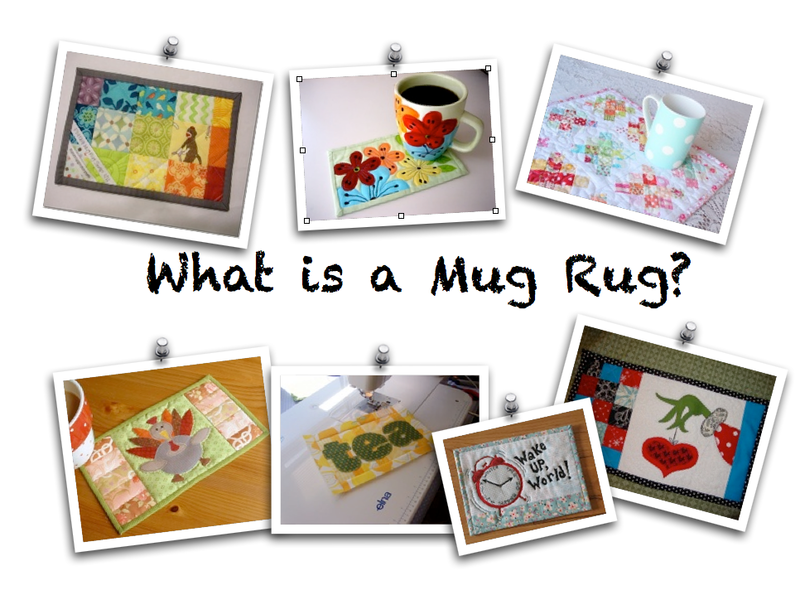 Hopefully this post will help you embrace the name “Mug Rug” and understand how the Mug Rug is part of the Modern Quilting movement. Let me first tell you how it started, according to one particular blogger named Erin. For all intensive purposes we will consider Erin my “source.” She blogs over at Two More Seconds and really enjoys making Mug Rugs. She explains, in 2010 Amanda from Ms McPorkChop Quilts posted a picture of her creation that included some flying geese and called it a Mug Rug. Check out the pictures, pretty cute! So, there you have it, a Mug Rug is not a coaster it is more then that! The Mug Rug should also be considered “Modern” because is was created in 2010! This modern day creation is an excuse to play with some scraps, perfect a block, practice free motion quilting or even binding but also an excuse to make something small and unique for someone else or for you! What is a Mug Rug? A Mug Rug is a mini quilt, which can be used to rest your coffee and that extra cookie you decided you needed. Where did the name come from? Apparently, a blogger named Amanda came up with the name and it stuck, causing Mug Rugs to be created all over the world. How big should it be? It can be as small as a coaster or a big as a placemat. Is it a coaster? No it is not a coaster but you can rest your drink on it. Well guys, I think that is all for now! I hope now that we understand the Mug Rug we can embrace its quilt-like uniqueness. Remember our next meeting is at Whipstitch Fabrics on 02/28 at 7pm. Mark your calendars and I hope to see you there! Make sure you follow the schedule and be ready to post your pictures to our flickr group for the Mug Rug Swap Parade! This entry was posted in Swaps and tagged defined, modern quilting, mug rug swap, quilting, sewing by West Atlanta Modern Quilt Guild. Bookmark the permalink.